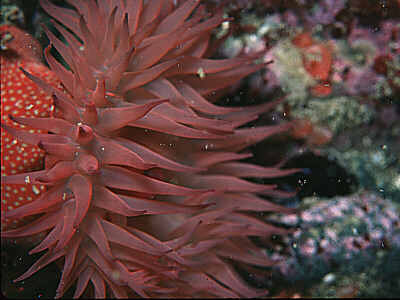 Description: This sea amemone is similar in form to Actinia equina but typically larger, up to 100mm across base. The column is red or dark red spotted with 'pips' of green, yellow or blue. The tentacles are usually red or purplish. Not known to reproduce by viviparity (c.f. 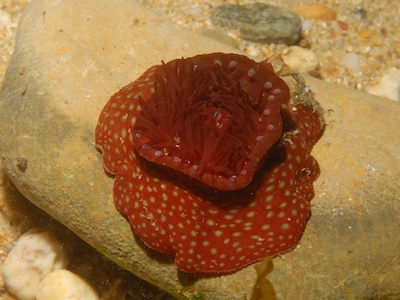 Actinia equina). Habitat: Usually found on the lower shore and probably in the shallow sublittoral, on rocks, etc. Distribution: Rather local and apparently confined to the English Channel and south-west England. Similar Species: Most likely to be confused with Actinia equina which has variants which look very like this species. Larger size and less variable coloration than Actinia equina. Picton, B.E. & Morrow, C.C. (2016). Actinia fragacea Tugwell, 1856. [In] Encyclopedia of Marine Life of Britain and Ireland.